Venture into the twilight with Born into Darkness, a thrilling hidden object race to uncover the secrets of eternal life! Amber is a night curator and a vampire. One night, she finds the new assistant curator breaking into a museum exhibit who confronts her with a strange proposition - help him find the legendary Shroud of Lazarus, a relic said to cure any ill, including her vampirism. Agreeing, they set off but soon realize that it is a dangerous quest. Take this gripping journey to recover the Shroud! Visit dark and unwelcoming locations searching for its resting place. Unearth remnants once draped in conspiracy to pick up the trail. Solve baffling puzzles, fend off vampires, and piece together strange clues. Help Amber become human, or be doomed to her curse forever! 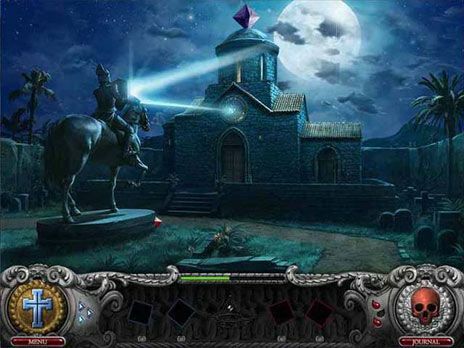 * Take a shadowy journey through ancient conspiracies in this hidden object thriller. * Locate a miraculous Shroud said to cure any ill. Resolve a deadly past and confront an impending evil. * Solve baffling puzzles and fend off bloodthirsty vampires. * Lift the vampiric curse or be doomed forever. Free Ride Games is the only place where you can download over 300 top games for free, including Hidden Object games, Time Management games, Match Three games, Sports games, Puzzle games, Arcade games, Card games, Board games, Flash games, Fashion games, Food games, Online games, Word games and many more. We have hundreds of choices from the leading game publishers like iWin, PlayFirst, Sandlot Games, Mumbo Jumbo etc. Born Into Darkness free game for free now. Planetsofts.com didn't scan Born Into Darkness Game for viruses adware, spyware, or other badware. For safety reasons, we recommend that you always keep an updated antivirus installed on your pc when downloading and installing software from the web.